The proxy contest for influence between the European Union and Russia in a wide arc of states encompassing eastern Europe, the Caucasus and central Asia is changing shape, says Katinka Barysch. The United States is withdrawing from the former Soviet space; the European Union struggles to be taken seriously there. Does that leave Russia free to strengthen its influence in the countries around its borders? Not necessarily, for the situation in the region is complex. Hillary Clinton visited the south Caucasus on 4-5 July 2010 to reassure Georgia, Armenia and Azerbaijan that Washington had not abandoned them in its quest to “reset” relations with Russia. Nevertheless, the predominant feeling in those countries is that the US is a lot less interested and engaged than it had been during the presidencies of George W Bush and Bill Clinton. Similarly, many central Asians feel that the Barack Obama administration pays little attention to them, unless they can serve as launch-pads for planes destined for Afghanistan. Nato membership for Ukraine and Georgia is no longer on the cards. Much of America's attention has moved elsewhere. But the European Union hardly has a foothold in the region. The EU's neighbourhood policy has proved rather ineffective, and the “eastern partnership” launched in May 2009 has not yet had time to make much of a difference. Ukraine, still smarting that the EU has never offered the prospect of membership, appears - after the election of Viktor Yanukovych in January-February 2010 - to be turning towards Russia. Moldova, by contrast, looks keener than ever to get closer to the EU; though few people in Brussels and other capitals are taking notice. The EU's central-Asia strategy has lacked political backing and consistency. Both there and in the Caucasus, the EU is a rather new player and its traditional approach of exporting norms and values as the basis for bilateral relations has not been received well. The fact that the EU's foreign-policy machinery is currently in a condition of bureaucratic paralysis does not help. In theory, American neglect and European weakness could leave Russia free to consolidate what Dmitry Medvedev likes to refer to as a “sphere of privileged interests”. Russia is certainly trying. But success has been patchy at best. Russia is by far the most populous and prosperous country in the region, but it does not necessarily have the means to project power into its “near abroad”. Its tools looked more formidable until they were actually used. Now some of them have turned out to be blunt (see Fyodor Lukyanov, “Russia’s Zone of Responsibility”, Russia in Global Affairs, 10 July 2010). Russia's use of military force in Georgia in August 2008 backfired when even Moscow's staunchest allies scrambled to become less reliant on what started to look like a dangerous and overbearing neighbour: Belarus turned to the European Union, Armenia started talking to Turkey, and none of the former Soviet countries has to date followed Moscow in recognising the independence of Abkhazia and South Ossetia (see Neal Ascherson, “After the war: recognising reality in Abkhazia and Georgia”, 15 August 2008). Russia has repeatedly used trade embargoes and other economic means to put pressure on its neighbours, in particular smaller ones (such as Georgia and Latvia) where Russia’s own business interests are limited. But the use of economic sanctions has arguably not got Russia what it wanted in even a single instance. Businesses in the countries affected have reinforced their efforts to find alternative markets and sources of investments, making them less dependent on Russia in the long term. Moscow's strategy of gaining influence through directly controlling local businesses has proven more successful: in Armenia for example, various sectors (such as banking and transport) are dominated by Russian-owned companies. How this will translate into political leverage remains to be seen. This leaves energy as the most promising tool of Russia's neighbourhood policy. Russia has used pipeline plans, nuclear projects, gas prices and oil deliveries to get what it wants from the countries across its borders. But even here, Russia's success-rate is mixed. In Belarus and Ukraine, Russia is making headway towards its aim of gaining control over transit pipelines. The latest standoff between Belarus and Russia over gas prices and transit-fees only highlights Minsk's lack of options: Alexander Lukashenko's announcement that he would buy gas from Venezuela is little more than symbolic. In Ukraine, Russia managed to use the offer of cheaper gas to get the lease for its Black Sea fleet in Sevastopol extended. It has also successfully pressured Kyiv into at least considering merging parts of the two countries' gas monopolies, Gazprom and Naftogaz, which would give Moscow effective control over Ukraine's transit pipelines. The situation is very different in the Caucasus and central Asia, where energy-producing countries are gaining room for manoeuvre through building stronger links with China, Iran and Turkey. Turkmenistan opened a large gas pipeline to China in December 2009 and signed another gas-delivery contract with Iran in June. It has invited international oil majors to help build an internal pipeline that could one day deliver Turkmen gas from the massive Yolotan field to the Caspian shores and from there to Europe. It had previously promised to let Russia build the pipeline and buy much of the gas. Azerbaijan has spurned a Russian offer to buy up all the gas from its new Shah Deniz 2 field, instead committing it to Turkey and to European buyers. Russia's attempts to lock up Caspian gas supplies by foiling pipeline projects such as Nabucco are looking increasingly desperate. 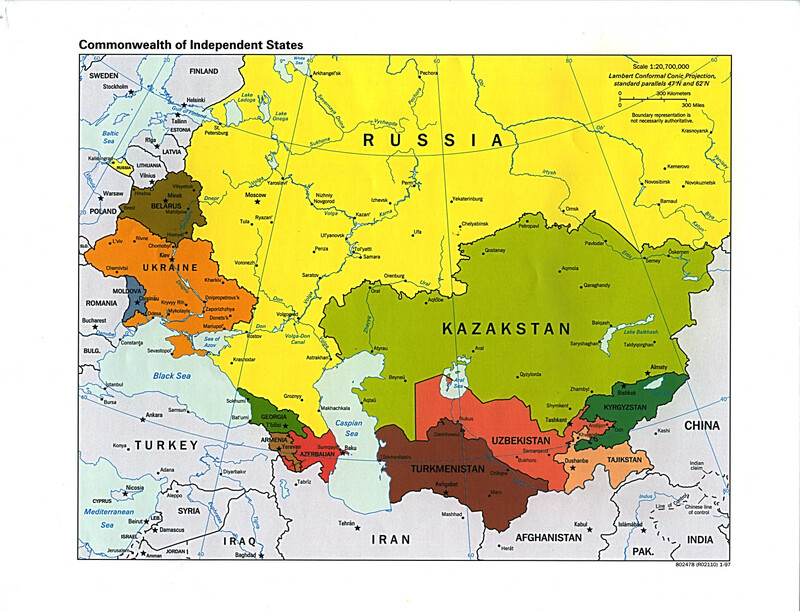 The perceived withdrawal of the United States and the ineffectiveness of European Union policy in the region has not so far played into Moscow's hands (see “Europe and the Russia-Georgia conflict”, 30 September 2008). Russia (like the EU and other players in the region) has had to learn that the former Soviet Union does not constitute a homogenous neighbourhood. There are confident and cash-rich energy-suppliers such as Azerbaijan and Kazakhstan, and there are poor and divided countries such as Moldova and Armenia. Russia can cajole and coerce in one place but it has to plead and please in another. All states in the region will benefit from being less dependent on Russia, in trade and energy terms as well as in politics. Washington might be paying less attention to the region; the EU should redouble its efforts, while also taking more account of the specific situations of individual countries.